What are your best tips for debugging Python? Please don't just list a particular debugger without saying what it can actually do. There are either too many possible answers, or good answers would be too long for this format. Please add details to narrow the answer set or to isolate an issue that can be answered in a few paragraphs.If this question can be reworded to fit the rules in the help center, please edit the question. You can use the pdb module, insert pdb.set_trace() anywhere and it will function as a breakpoint. To continue execution use c (or cont or continue). ipdb is a version of pdb for IPython. It allows the use of pdb with all the IPython features including tab completion. It is also possible to set pdb to automatically run on an uncaught exception. Pydb was written to be an enhanced version of Pdb. Benefits? 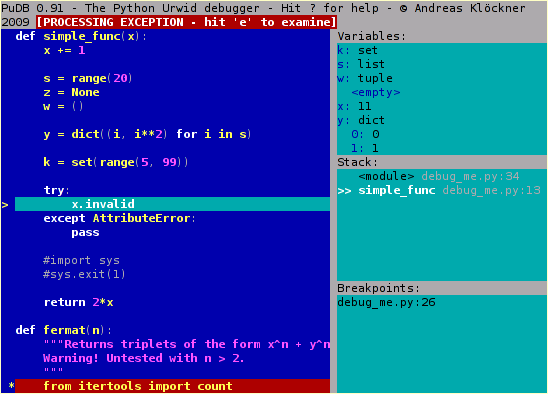 http://pypi.python.org/pypi/pudb, a full-screen, console-based Python debugger. Its goal is to provide all the niceties of modern GUI-based debuggers in a more lightweight and keyboard-friendly package. PuDB allows you to debug code right where you write and test it – in a terminal. If you've worked with the excellent (but nowadays ancient) DOS-based Turbo Pascal or C tools, PuDB's UI might look familiar. # Print the instance variables of a thing. # Print the instance variables of self. Python already has an excellent built-in logging module. You may want to use the logging template here. The logging module lets you specify a level of importance; during debugging you can log everything, while during normal operation you might only log critical things. You can switch things off and on. Most people just use basic print statements to debug, and then remove the print statements. It's better to leave them in, but disable them; then, when you have another bug, you can just re-enable everything and look your logs over. This can be the best possible way to debug programs that need to do things quickly, such as networking programs that need to respond before the other end of the network connection times out and goes away. You might not have much time to single-step a debugger; but you can just let your code run, and log everything, then pore over the logs and figure out what's really happening. In case it disappears again, here are the templates I mentioned. This is code taken from the blog; I didn't write it. # Your program goes here. # You can access command-line arguments using the args variable. It is possible to print what Python lines are executed (thanks Geo!). This has any number of applications, for example, you could modify it to check when particular functions are called or add something like ## make it only track particular lines. If you want to be able to easily access your console history look at: "Can I have a history mechanism like in the shell?" (will have to look down for it). Auto-complete can be enabled for the interpreter. ipdb is like pdb, with the awesomeness of ipython.